It took me a couple full days to finish these costumes. I am evidently not so good with elastic. Everything with elastic was too big. I made the knee pads for Wonder Red with elastic and they are down around her ankles. Oops. 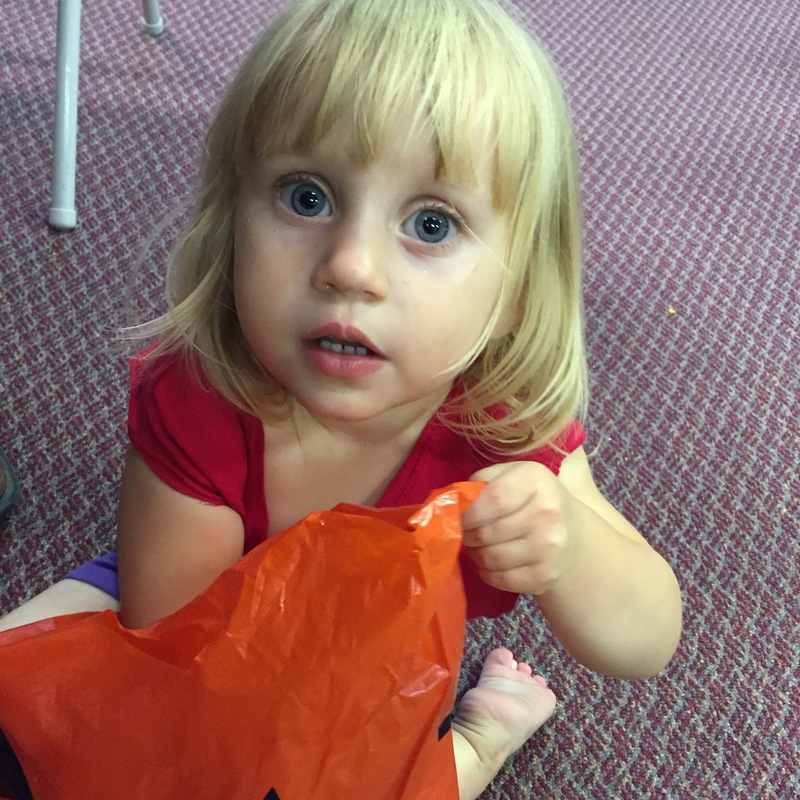 This was at our Fall Festival at our Church. They had games for the kids to play to get candy or a toy prize. 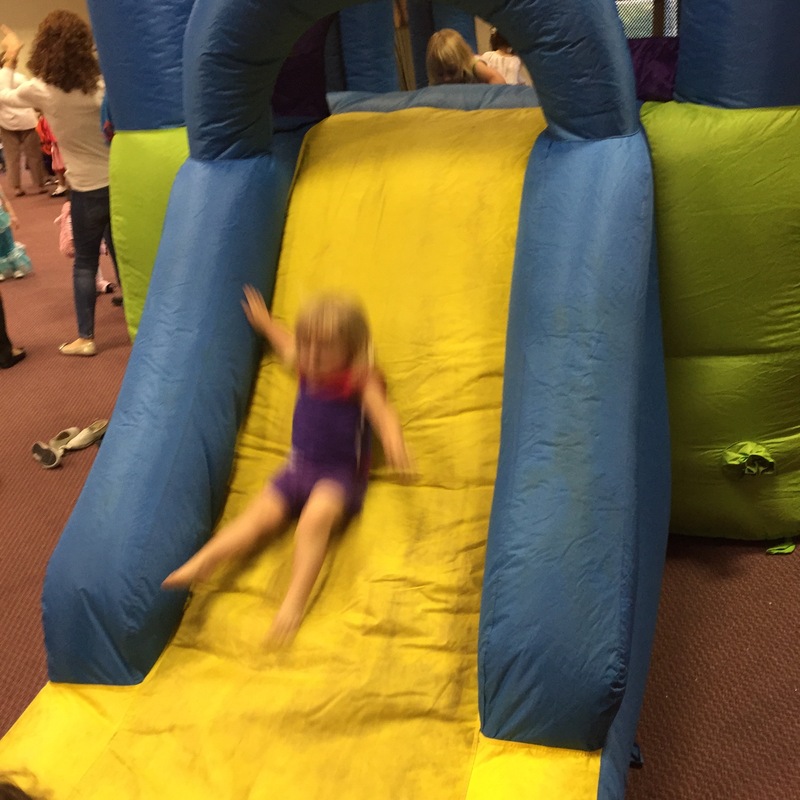 They had a bouncy house, which by far was the most popular thing for all the kids. I could not for the life of me find a pink crown. I found purple, green, silver, and more, but no pink ones. So we went to the dollar store to improvise. I bought pink foam crown shapes, and pipe cleaners. I used hot glue to fold over the bottom of the crown to encase the pipe cleaners to hold it onto her head, and also to glue on the gems to the crown. 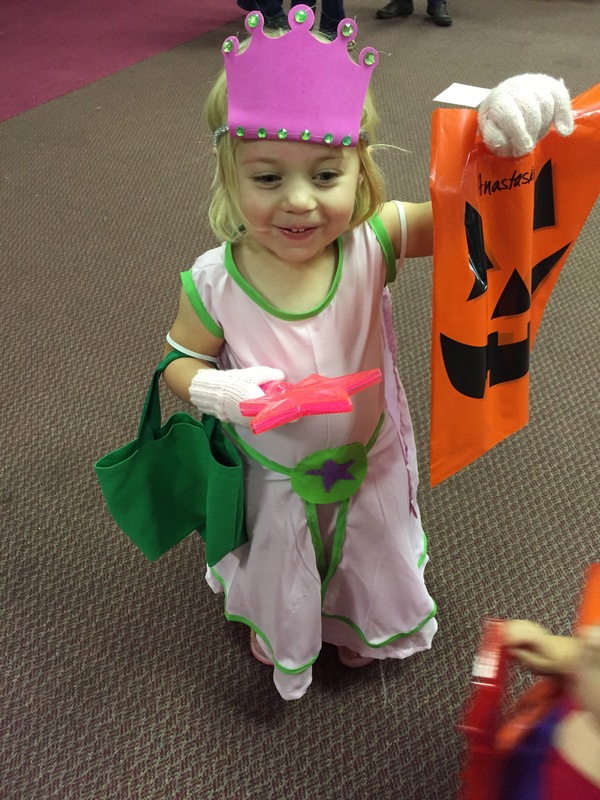 However, her forehead turned pink… and it just had to wear off, wipes didn’t help. 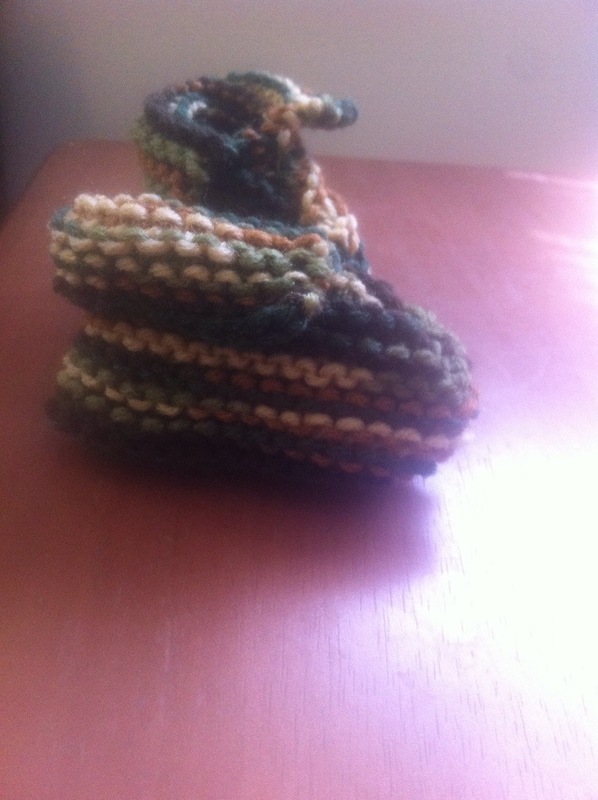 I’ve started selling my knits. If you see something you want and want to order it, just send me a message or email me. I’m more than happy to oblige you in whatever colors you want. I can take Paypal or Personal Checks through the mail (though I will have to wait until the check clears before I can send you your order). This is the first time I’ve had chicken in months, it tasted pretty amazing. I only wish that I wasn’t rushing to get out the door. I should’ve started cooking earlier. I have to say though that it was a pretty quick meal to cook anyways. I started cooking around 5:40 after saying good bye to the kiddos and was out the door at 6:20. 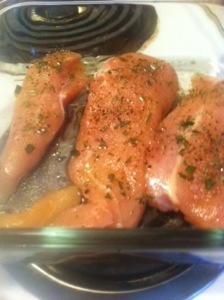 Start with however many chicken breasts that will feed your family. Pat them dry, sprinkle on some fresh rosemary (minced), salt, pepper, garlic powder (or minced garlic if you’re not crunched for time). Drizzle with olive oil. Bake in the oven at 450 degrees for about 10 – 15 minutes. When it’s cooked through drizzle some balsamic vinegar over it. This honestly is my favorite green beans recipe. 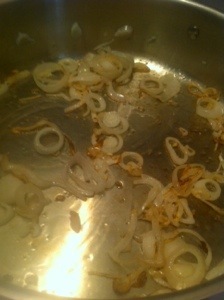 Slice a couple shallots and throw them in a preheated pan over medium-high heat with some olive oil. Season with salt to draw the liquids out and caramelize them. 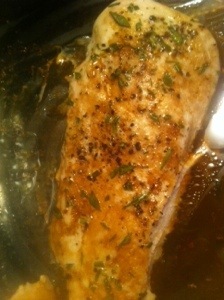 I like them all browned on the edges, deeper than the picture below. 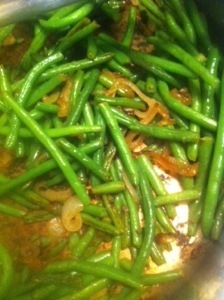 When you get it how you like it, throw in some frozen green beans, or some fresh blanched ones. (I don’t think canned will work that well as you’d basically have a bunch of mush when you’re done.) Season with salt and some garlic powder (or minced garlic). Keep moving them around the pan until they are thawed and to the tenderness of your liking. Sometimes I even like them to get a little brown and caramelized on a side or two. The shallots really add something to it. So yummy! I sliced the zucchini in 1/4″ thick pieces. You can go thinner if you want. 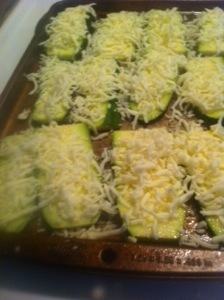 Coat the baking sheet with cooking spray, lay the zucchini on it, sprinkle some salt on it. Give it another spray of oil, then layer on the mozzarella. I put it in the oven with the chicken for the last 5 minutes. The cheese will melt. 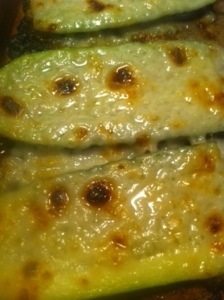 When the chicken’s done, turn on the broiler and put the zucchini right under it to brown the cheese. The second day of the South Beach Diet is going pretty well. I had a mushroom and asparagus omelet (well it was supposed to be an omelette – but it just turned out like scrambled eggs. I need to get a teflon skillet), and I had a salad for lunch with turkey lunch meat, hardboiled egg, tomato, cheese, sunflower seeds and balsamic vinaigrette. Snacks were reduced fat cheese sticks and almonds. It was pretty good. 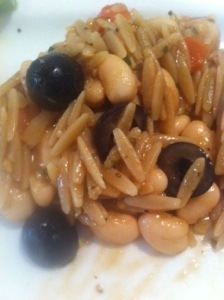 First time I had orzo pasta. My husband liked it too. We planted some zucchini that I had started indoors. It was about 3 inches tall so I decided it was time. I put a milk jug over the tops of them so that it would act kind of like a greenhouse. I also had a cucumber plant that was ready for planting. As far as seeds go I planted 5 green bean plants. Some parsley, chives, and some green onions. 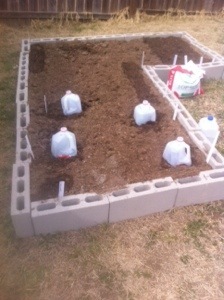 I have regular yellow onions and shallots planted. I’ve been working on building up my inventory of merchandise to sell on Etsy. 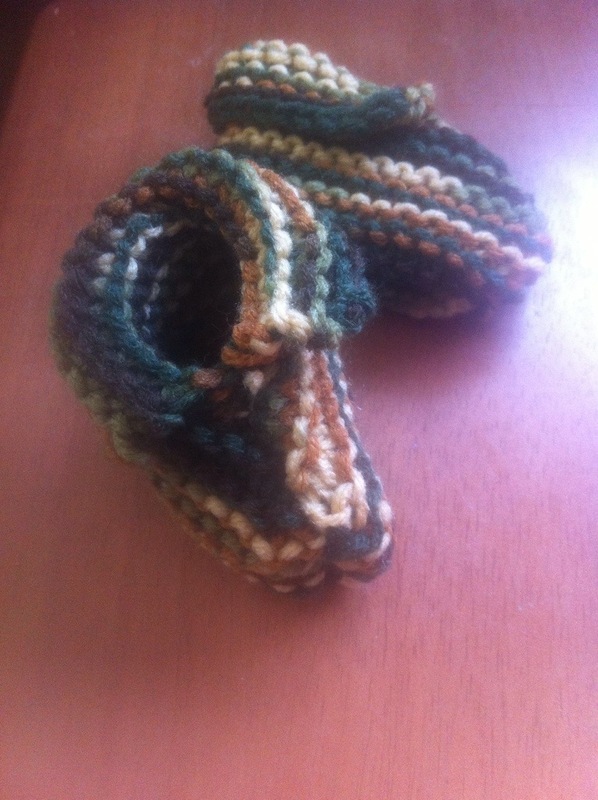 This is the first bib that I have made. I haven’t quite finished it yet. I still need to make a button hole and sew a button on it. I think it looks pretty good so far. I’m using the same shape for all the baby bibs. I really like how they cover the front of my kids, it’s the biggest bib that I have, so the food doesn’t go anywhere but the bib. Very nice. This is the back “pasture” of our farm. It has a bunch of trees seeding tiny trees. Because there’s basically no sun reaching the bottom, there is no grass growing back there. There are a bunch of old leaves covering the ground also. I haven’t done much research on this, but a low yield burn may just be what we need for that. Next summer we plan on cutting down the big trees and having a big party to invite a ton of people to come help. Firewood as a give away for those who come help. Yes that is rusty barbed wire randomly on the ground back there. This is a tree that’s in the hedgerow close to the garden. It’s HUGE! Four to five people could probably stand around it with their arms out spread holding hands. This is the garden. Wait, you say, it looks more like a lawn. Yes because someone planted a tall grass for the cows to eat, but never let them over in that area to have them eat it. Then it seeded and spread the seed all over the garden. This is the ancient rototiller. With a tub with a hole on it to “cover” it from the weather. It broke down halfway through the job. Time for a new one, I’d say. Yes, that’s a bunch of junk that’s probably been sitting there for years. This is one of the four peach trees. Not pruned very well. This is another peach tree and cherry tree. These are the two apricot trees that haven’t produced for 15 years. I’ve collected soil samples to take to the extension office to see if we can fix it by icing the soil. Hopefully we don’t have to cut hem down. This is the pear tree. We canned 16 quarts of pears from this, plus probably a 5 gallon barrel we gave away. Two more peach trees. That big tree is supposed to be a pecan tree, but it has never produced anything for lack of another tree to pollinate it or something like that. Evidently someone mowed over it in their teenage years. The garden after one run through with the rototiller and a raking. And after the second one and raking. My husband is using the tractor to cut down the tall grass around the garden. Hopefully we’ll have another free day to prep the garden and use the tractor again as well as my husband’s grandfather’s rototiller, which is substantially newer than the one pictured above. Hardiness Zone: Grown as an USDA Hardiness Zone Annual. Cooler zones can grow dill throughout the summer. Zone 9 and above generally grow dill during the winter season. In hot weather, dill may go to seed quickly. Dill can also self-sow readily. Mature Size: Varies with variety, from about 18″ to 40″. Spacing varies from about 6-8″ to 12-18″. Bloom Period/Days to Harvest: You can harvest leaves at any time. Dill generally blooms about 8 weeks after sowing. Once the flowers develop, the plants stop producing foliage. Planting: Direct sow seeds about the time of your last expected frost date. Plant about 1/4 inch deep. You will probably need to thin your plants, once they reach about 6-8″ high. You can always eat the thinnings. Dill can be started indoors, about 4 – 6 weeks prior to planting outdoors. Don’t wait too long to transplant, since dill has a tap root and will be unhappy in a small pot. To keep dill producing all summer, you can succession plant every 2 weeks. Size: Varies with variety. ‘Sweet Basil’ can reach 6′, but grows to about 3′ for most gardeners. There are also short 6″ dwarf varieties, which work especially well in pots. Bloom Period/Days to Harvest: You’ll want to prevent your basil from blooming for as long as possible, by harvesting or pinching off the top sets of leaves as soon as the plant reaches about 6″ in height. If the plant sets flowers, it is on its way to going to seed and will not be bushing out with leaves. Once a basil plant goes to seed, the existing leaves lessen in flavor. Cultural Notes: Basil is a heat lover. Don’t bother planting it until the daytime temperatures remain in the 70s F. and night temperatures are above 50 degrees F. Seeds can be started indoors 3-4 weeks before last spring frost date. Unlike many Mediterranean herbs, basil likes a somewhat rich soil and doesn’t like to be kept dry. Space plants about 10″ apart. They will bush out. Begin pinching the tops off once the plants reach about 6″ in height. If you don’t pinch or harvest, the plants will grow tall and gangly, with few leaves and will bolt to seed. You can continue harvesting as long as there are leaves left on the plant to keep it going. Basil is very sensitive to frost and will be one of the first plants to go in the fall. You can extend the season slightly by covering your plants with row covers when frost is threatened. However, if the leaves are touched by a frost covered row cover, that’s enough to likely turn them black. If you live in a frost free area, you might want to allow some basil plants so set flowers and self-seed in your garden. Not all varieties will do this successfully. Exposure: Full sun, partial sun, shade. Best sown in cooler weather as it tends to go to seed in high heat. Harvest: For cilantro, harvest the leaves with sharp scissors. If coriander is wanted, let a few of the stems go to seed and then cut the entire flower. Uses: Cilantro is a common ingredient in Latin and Indian cuisine. To release more of the flavor from the coriander, roast the seeds in a dry, hot pan for a few minutes until you can smell the scent strongly. These seeds are ground in a mortar and pestle or herb grinder before use. Coriander is easy to grow indoors and out. It is a good idea to have two separate plantings so you can harvest the tender leaves and stems for cilantro and let one patch go to seed for coriander. Coriander likes well drained, rich soil and will bolt and turn bitter if grown at temperatures over 75 degrees, so plant it after frost has passed but enjoy it until the full heat of summer hits. Harvest: Snip leaves at any stage, four to six inches is optimal. When leaves turn yellow, pick them out and harvest more vigorously to keep this at bay. Flowers are edible and delicious in salads as an attractive, edible garnish. USDA Hardiness Zones: Zones: 5-10, depending on variety.Oregano heracleoticum, ‘Greek Oregano’, is hardy in Zones 5-9. Exposure: Full sun Golden oregano does best in partial shade; its leaves tend to scorch in full sun. Mature Size: Oregano can reach a height of 30″, but usually grows between 8-12″, especially if you are harvesting regularly. Plants will spread about 18″ and will send out runners. Bloom Period/Days to Harvest: As with most herbs, oregano leaves taste best before the plant flowers. You can begin harvesting when plants have reached 4-5 inches in height. Cutting stems all the way back to the ground will encourage more stems and a fuller plant. The stems tend to get woody and the easiest way to strip the leaves is to hold the stem by the top, uncut end and run your finger down the stem. Mature Size: Varies with variety:Height: 12 to 18 inches (30 – 45cm). Days to Harvest: Seed germinates in 21 – 28 days. Seed grown plants ready to harvest in 12 – 14 weeks. Growing and Caring for Rosemary Plants: The three fundamentals for successfully growing rosemary are: Sun, Good Drainage and Good Air Circulation. If you live in a frost free area, you can grow rosemary in the ground year round. Provide a sandy, well draining soil and 6-8 hours of full sunlight. Rosemary is not a heavy feeder, but fertilizing in spring with a fish/kelp emulsion will get it off to a good start for the season. Periodic foliar sprays with the emulsion will keep it looking great. Bringing Rosemary Indoors: Where the winter temperatures dip below 30 degrees F., rosemary plants will have to spend the winter indoors. In this case, it’s easier to grow your rosemary in a container all year. Since rosemary likes it on the dry side, terra cotta pots are an especially good choice. Just be sure it doesn’t bake and completely dry out while outdoors during the summer. Bring the potted rosemary inside once the temperature inches into the 30s. It can be a little trickier to keep rosemary happy inside. Your rosemary plant will still require 6-8 hours of full sun, so artificial lights may be necessary. Heat is not as crucial as sunlight. Sun Exposure: Generally Full Sun. Needs some shade in higher Zones. Bloom Period/Days to Harvest: Blooms mid-summer. May bloom first year depending on size and site. Allow the plant to grow unharvested for the first year. Then leaves can be harvested at anytime, although they are consider at their best before or just after blooming. Mature Size: Varies with variety. Thyme is generally low growing, spreading, 6 – 10″ in height. Some varieties form an almost flat carpet. Days to Harvest: Established thyme plants can be harvested at any time. Simply snip a few stems. The blossoms are also edible and are at their best when first opening. Thyme grows slowly from seed and should be allowed a few months of growth, before cutting. Mature Size: 60 ft. tall, if left unpruned, in the ground. Bloom Period / Days to Harvest: If unpruned, bay should prune in mid-spring. You can begin harvesting when your tree is several feet tall, but you can always use the pruned leaves in the meantime. When to Plant: Fall is garlic planting time. Depending where you are gardening, this could be September to November. Once the soil temperature has cooled off to about 60 degrees F. , the roots of the garlic clove will start to germinate and begin to take hold and anchor the plant. This is especially important in Northern climates where the ground freezes. Without sufficient time to grow good roots, the garlic plants will heave out of the ground. A three to four inch layer of mulch applied after the ground freezes will also help prevent heaving. Straw is the mulch of choice because it’s cheap and easy to remove. Problems: Garlic is relatively pest free, if you use good seed cloves. It is, however, popular with some rodents, especially gophers. Storing Garlic: Brush off any soil clinging to the bulbs. Allow the bulbs to cure or dry for three to four weeks in either a well-ventilated room or a dry, shady spot outside. Once the tops and roots have dried they can be cut off. You can also further clean the bulbs by removing the outer skins. Just be careful not to expose any of the cloves. Garlic likes to be on the cool side, 32oF – 40oF. The softneck varieties may last 6 – 8 months. Hardnecks should be used soon after harvesting. Hardneck varieties may dry out, sprouting or go soft within 2-4 months. Keeping hardnecks at 32oF sometimes helps them survive for up to 7 months without deteriorating. What to Plant: Garlic is one of the easiest plants to grow. You plant the individual cloves within the bulb. Plant the largest cloves you have, to get the largest bulbs. Plant each garlic clove two to three inches below the soil surface and about 6 inches apart. Growing Requirements: As with most plants, your success in growing this coveted plant will depend both on what kind of growing conditions you can provide and which varieties you select to grow. Lavender plants will tolerate many growing conditions, but it thrives in warm, well-drained soil and full sun. Like many plants grown for their essential oils, a lean soil will encourage a higher concentration of oils. An alkaline and especially chalky soil will enhance lavenders fragrance. While you can grow lavender in USDA Zone 5, it is unlikely you will ever have a lavender hedge. More realistically you can expect to have plants that will do well when the weather cooperates and to experience the occasional loss of a plant or two after a severe winter or a wet, humid summer. Lavender is a tough plant and is extremely drought resistant, once established. However, when first starting you lavender plants, don’t be afraid to give them a handful of compost in the planting hole and to keep them regularly watered during their first growing season. Special Considerations: It is dampness, more than cold, that is responsible for killing lavender plants. Dampness can come in the form of wet roots during the winter months or high humidity in the summer. If humidity is a problem, make sure you have plenty of space between your plants for air flow and always plant in a sunny location. Areas where the ground routinely freezes and thaws throughout the winter will benefit from a layer of mulch applied after the ground initially freezes. Also protect your lavender plants from harsh winter winds. Planting next to a stone or brick wall will provide additional heat and protection. Pruning: Although lavender plants get regularly pruned simply by harvesting the flowers, to keep them well shaped and to encourage new growth, a bit of spring pruning is in order. The taller varieties can be cut back by approximately one-third their height. Lower growing varieties can either be pruned back by a couple of inches or cut down to new growth. If you live in an area where lavender suffers some winter die-back, don’t even think about pruning your plants until you see some new green growth at the base of the plant. If you disturb the plants too soon in the season, they give up trying. Less Tender Herbs — The more sturdy herbs such as rosemary, sage, thyme, summer savory and parsley are the easiest to dry without a dehydrator. Tie them into small bundles and hang them to air dry. Air drying outdoors is often possible; however, better color and flavor retention usually results from drying indoors. Tender-Leaf Herbs — Basil, oregano, tarragon, lemon balm and the mints have a high moisture content and will mold if not dried quickly. Try hanging the tender-leaf herbs or those with seeds inside paper bags to dry. Tear or punch holes in the sides of the bag. Suspend a small bunch (large amounts will mold) of herbs in a bag and close the top with a rubber band. Place where air currents will circulate through the bag. Any leaves and seeds that fall off will be caught in the bottom of the bag. Another method, especially nice for mint, sage or bay leaf, is to dry the leaves separately. In areas of high humidity, it will work better than air drying whole stems. Remove the best leaves from the stems. Lay the leaves on a paper towel, without allowing leaves to touch. Cover with another towel and layer of leaves. Five layers may be dried at one time using this method. Dry in a very cool oven. The oven light of an electric range or the pilot light of a gas range furnishes enough heat for overnight drying. Leaves dry flat and retain a good color.